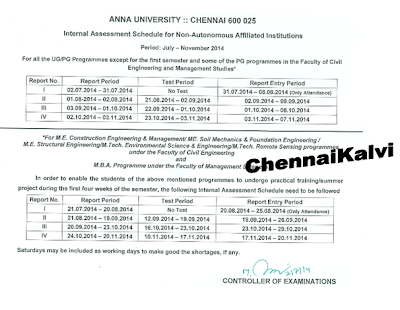 For Higher Semester First Internal Assessment Entry Period Started on 31.07.2014. And the colleges are started the Entry work. But, till now the Report is not reflected in Students Login in COE Portal. As per the New Schedule for this ODD Semester, As per AU Schedule the UG Classes are starting on 02.07.2014 only. But Many Colleges are opened the colleges a week before. In this Period there is No Internal Assessment Exams. The Report Entry Period is : 31.07.2014 to 08.08.2014. Students can Check their Attendance Status from 31.07.2014 Evening from the COE Portal's Students Login. The Report Entry Period is : 02.09.2014 to 09.09.2014. In this Report Period the Exam Marks and Attendance will be updated. Students can Check their Attendance & Internal Assessment Test Marks from 02.09.2014 Evening from the COE Portal's Students Login. The Report Entry Period is : 01.10.2014 to 08.10.2014. Students can Check their Attendance & Internal Assessment Test Marks from 01.10.2014 Evening from the COE Portal's Students Login. The Report Entry Period is : 03.11.2014 to 07.11.2014. Students can Check their Attendance & Internal Assessment Test Marks from 03.11.2014 Evening from the COE Portal's Students Login.